5 Easy Ways to Boost Summer Productivity ADA Compliance: How Much Is Enough? In 2012 the ERC Paid Holiday Survey found that on average, most employers were planning to offer between 9 and 10 paid holidays to their workforce in 2013, an average that has remained steady for a number of years. The range of total holidays offered also remains fairly consistent from past years with one employer reporting as few as 3 and one reporting as many as 16 days. 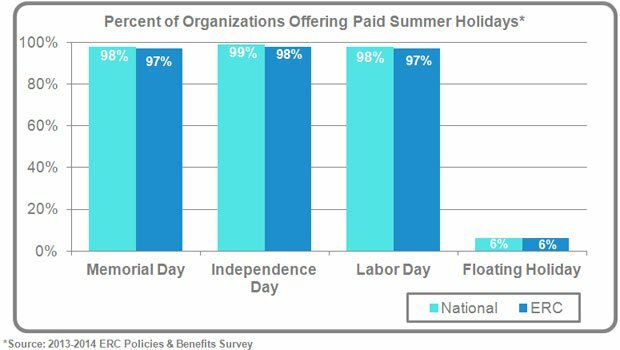 As the chart below demonstrates, the region is very much in line with the national standards in terms of which holidays employers choose to offer to their employees as paid holidays. All three major “summer” holidays are nearly universally part of this holiday time-off plan. Some employees may find themselves with extra days off in the summer for other reasons as well. While not technically a summer holiday, floating holidays are offered by about 6% of employers. These extra days off typically include just one to two additional paid days-off to be taken at the discretion of the employee- and what better time to take an extra day off than summer? Another example, July 5th, 2013, is being offered by 14% of employers in Northeast Ohio. While most employers don’t typically include the day after Independence Day in their holiday schedule, in 2013 July 4th falls on a Thursday and giving some employers the opportunity to grant their employees an extra little perk by extending the July 4th holiday into a rare 4-day weekend. Finally, a small proportion of the sample (3%) from the ERC Paid Holiday Survey indicated that they would be shutting down operations for an extended period of time during the summer. In past years one or two non-manufacturing organizations have been included in these so called, “summer shut-downs”. However, in 2013 these shut downs are found exclusively at manufacturers and are scheduled to last between 6 and 20 days during the month of July.